An Italian coachbuilder has created one angry-looking Alfa Romeo. 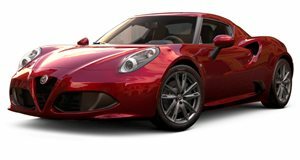 Last week, we learned that Alfa Romeo is planning to significantly expand its lineup with the launch of seven new models or refreshed models by 2022. While this will include a , the future isn’t looking good for the 4C. Glance at the automaker’s five-year road map, and you’ll notice the two-door sports car isn’t part of Alfa’s future plans. In other words, it's extremely unlikely the 4C is going to be renewed. To keep the sports car’s spirit alive, Italian coachbuilder Adler Group and Umberto Palermo's Up Design have created a concept car showing what an updated version of the 4C could look like. Called the Alfa Romeo Mole Construction Artisan 001 (we'll admit the awkward name doesn't exactly roll off the tongue), the concept is a more aggressive take on the current 4C’s design. Located next to the turn signals are diagonal LEDs on each corner of the lower front fascia, while the headlights now sit in flying buttresses. Coupled with bulging fenders, the Italian coachbuilder has created one angry-looking Alfa Romeo. At the rear, the intakes in the fenders have shrunk, but to compensate there are now large inlets running along the side that incorporate into the roof. Those small louvers in the back glass have severely compromised the rear visibility, though. Elsewhere, the 4C’s round taillight housings have been replaced with a shaper design and there are now stacked quad tailpipes. Inside, the two-tone tan and black cabin is relatively sparse. Unlike most modern cars, there’s a digital instrument display but no infotainment screen, strangely. Carbon fiber and leather materials feature extensively inside the concept. No powertrain details have been provided, but it’s probably safe to assume the concept is powered by the same 1.75-liter turbocharged gasoline engine as the current 4C, which produces 237 horsepower and 258 lb-ft of torque. This setup allows the Italian sports car to do the 0-62 mph sprint in 4.1 seconds and top out at 160 mph.